Travel Cambodia on a two-week vacation with your family from Phnom Penh, through the charming town of Battambang, the famous temples of Angkor in Siem Reap, toward the untouched beaches in Sihanoukville, the floating villages on Tonle Sap Lake. Following is the 13-day itinerary for your perfect Cambodia family adventure tour. Step your foot at the Phnom Penh International Airport and you will be met by your local guide and transferred to your hotel for check-in. Welcome to the vibrant capital of Cambodia, Phnom Penh. This city is situated on the confluence of the Mekong and Tonle Sap rivers. Phnom Penh is the charming attraction with many colonial buildings and wide, tree-lined boulevards. Spend the rest of the day for relaxing after a long flight. 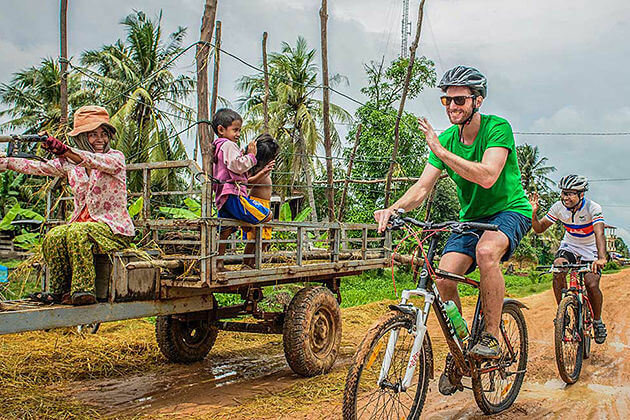 Your family adventure tour begins with an excellent city tour on a traditional cyclo. Start by the famous Wat Phnom with Khmer architecture. Go on along the magnificent riverfront to the Royal Palace dating back to 1866, where you may explore the Silver Pagoda which has a grand collection of gold, silver, crystal and bronze Budhhas. In the afternoon, spend time at your leisure or choose the optional activities: Monkey Business – the largest indoor playgrounds in Cambodia, Kids City – a one-stop-shop for children’s entertainment or Cambodia Living Arts (in the evening). Travel by private car to Phnom Tamao Wildlife Rescue Centre, the largest sun bear sanctuary in the world. At Phnom Tamao, you may see over one hundred bears that are protected, preserved and enriched the lives. Continue your adventure to Tonle Bati Temple in order to take pleasure in the peaceful gardens and enjoyable atmosphere when you stroll around this stunning Angkorian-style temple. Don’t forget to enjoy some fresh local fruits on the way back to Phnom Penh. Leave the bustle of the capital behind, plan itinerary for Battambang as the next destination in your vacation. On this drive, you will be able to see some of the most scenic rural landscape in Cambodia. 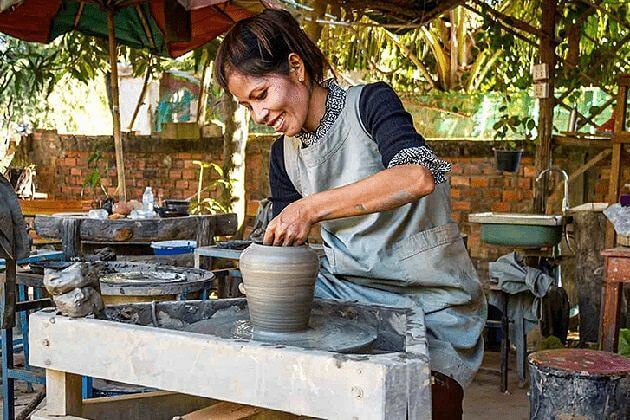 Stop at Kampong Chhnang which is famous for traditional pottery. 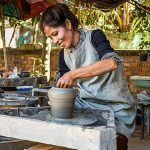 You have a chance to learn the different techniques required to make pottery as well as create your own jug or pot. After lunch, head to Kompong Luong and boat to visit the floating villages of Tonle Sap Lake including floating factories, church, pagoda, stations, fish farms, and even karaoke bars and police station. Enjoy the vibe of the town or head out on foot to see French colonial architecture. 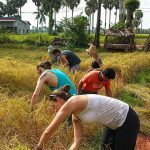 In the morning, you may choose one of two optional activities: have an exciting cycling trip with Soksa Bike in 30km to see rice paddies and orange trees; take a walking tour to explore several famous sites of Battambang. After lunch, visit Phnom Sampeau which means “Ship Hill” in Khmer for its distinctive shape, where has notorious killing caves. From the top of the small temple, you can see a fantastic view over the typical landscape of paddy fields and sugar palm trees. Your visit at Phnom Sampeau will end up with watching millions of bats flying out of a cave across the sky – a nightly spectacular show of nature. The next stop in your 13-day family tour is Banteay Chhmar which is home to a beautiful quaint temple. 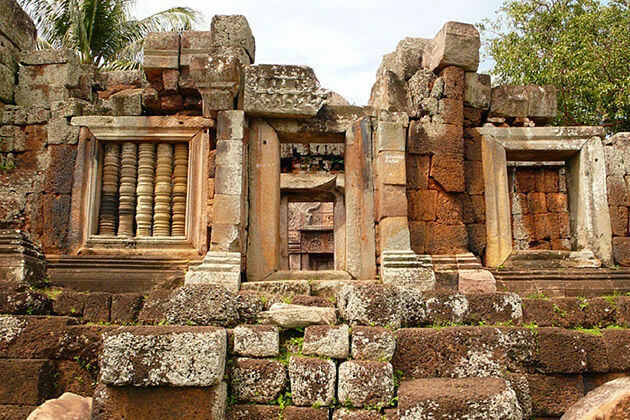 Visit Banteay Chhmar Temple which is applying for UNESCO World Heritage Site status. It absolutely makes your kids feel like true explorers as they discover how jungle-choked the ruins are which add to the charming atmosphere of the temple. Have a picnic lunch before coming back to the village. In the late afternoon, continue by an ox-cart tour in the Cambodian countryside scenes of paddy fields. 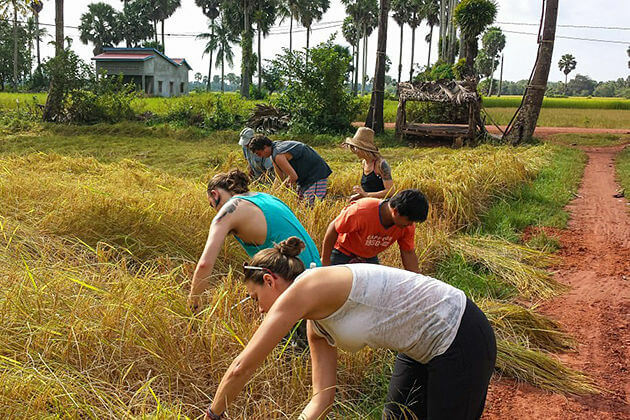 Go on an immersive tour of a typical Khmer village in which the tour guide will tell you more about the local life and vocations like fishing, rice farming as well as beekeeping. After that, travel to Siem Reap and check-in your hotel. Continue to Siem Reap to highlight your family vacation. To begin with, take a visit to the impressive Angkor Wat Temple considered the home of the gods. 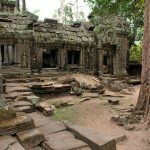 Then, head to Angkor Thom which includes Bayon Temple with giant stone smiling faces, the Terrace of the Elephants and the Terrace of the Leper King boasting intricate bas-reliefs. 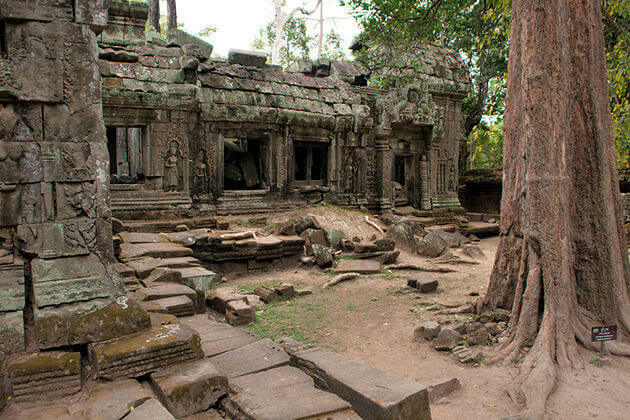 Your next stop should be Ta Prohm Temple where the famous film Tomb Raider was shot. 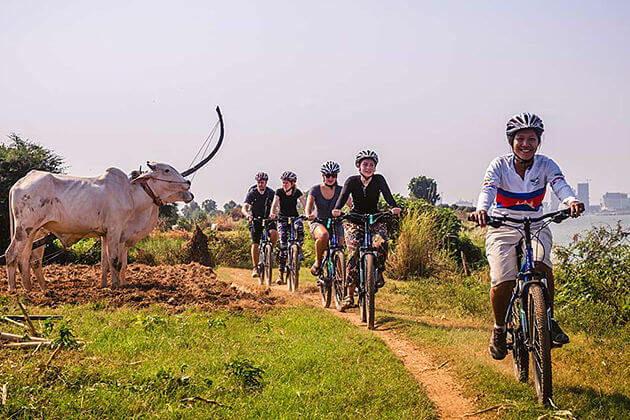 After lunch, you should decide on among three options: village cycling tour in 2 to 3 hours, horseback riding at Happy Ranch in 2 hours or swing like a monkey between the trees at Angkor Zipline. Today, your family have a chance to learn more about life in a typical Cambodian village, Ta Brak Village. The local guide will meet you in the morning at your hotel and take your family to a local family to get to know their usual morning activities. Go to the local market by a 30-minute ox-cart ride through the village. Then find out the activities on a community including rice planting, weaving thatch roofs or making fish traps. The next morning will be your leisure. Your family may be free to explore Siem Reap, go shopping or just relax at the hotel. In the morning, take a 1-hour flight to Sihanoukville. 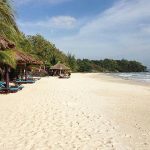 Once you arrive in Sihanoukville, you are welcomed by the sun, surf and sand portion of your Cambodia family adventure tour. 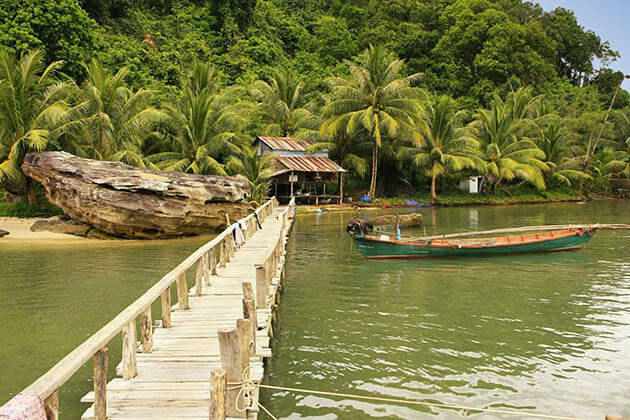 Spend the day in your itinerary to discover the Ream National Park located in a 210-square-kilometer area in the Gulf of Thailand. The park is for those who love nature with over 200 bird species, numerous different kinds of monkeys and even some pangolins. 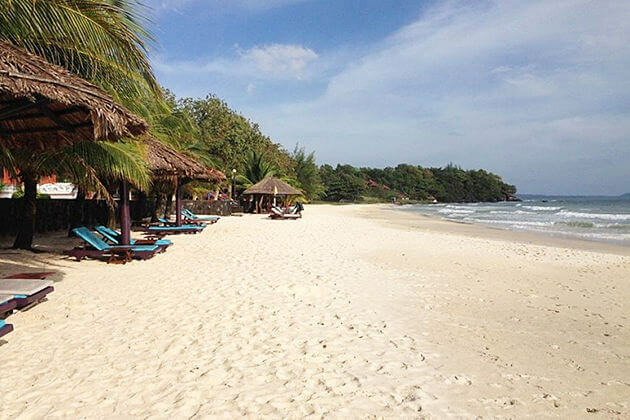 Afterward, visit one of the most beautiful and isolated beaches in the area, Koh Sampouch. 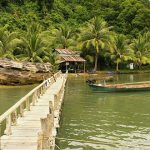 Explore three wonderful islands: Koh Chaloh, Koh Tres and Koh Takiev. Snorkel coral reefs, go fishing in crystal-clear waters or just relax by immersing on the white sand beaches. This morning is yours to spend in your way before transfer back to Phnom Penh to end your family’s itinerary in 13 days in Cambodia.